Book Passage contributing blogger Dax Proctor interviewed vegan chef and cookbook author Isa Moskowitz of the Post Punk Kitchen. 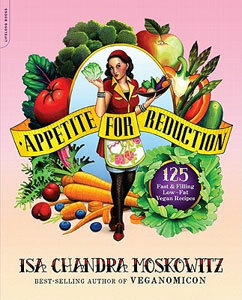 Isa's new cookbook is Appetite for Reduction: 100 Fast and Filling Low-Fat Vegan Recipes ($19.95). She will be appearing at the San Francisco Ferry Building in the CUESA kitchen for a food demo and book signing on Saturday, February 12, 2011 at 11:45 am. Book Passage is proud to partner with CUESA as the bookseller for this event. Don't miss it! Dax Proctor: You’ve mentioned in past interviews that you’ve been a vegetarian since your teenage years and you’ve followed a strict vegan diet for almost a decade now. How have your thoughts on being vegan and your approach to vegan cooking evolved over the years? Isa Moskowitz: My thoughts on being vegan have remained pretty much the same. For me, it’s always been about the animals. My cooking approach, however, has changed tenfold. My philosophy used to be more, “Throw it in the pot, see if it works.” And I think that got me to where I am today. But now, while I definitely still experiment, I’ve gotten more into perfecting techniques. But one thing that has remained consistent is that I never think of vegan food as “lesser-than.” I mean, I respect the ingredients and treat them as themselves, respect their unique characteristics. For the most part, I won’t work with fake meat and highly processed food. DP: Your website, Post Punk Kitchen (theppk.com) is the go-to resource for all things vegan on the internet. Has the community changed since you first started it? IM: Starting with the message boards, some really amazing things have come out of it. Most importantly, real life bonds have been formed. The site is different from other message boards because while there are epic threads on things like Glee and Sarah Palin, the bigger picture is that we actually know each other, and that is where real community happens. Together we’ve raised tens of thousands of dollars at bakesales, we’ve gone to protests, we’ve thrown parties, created vegan businesses and formed lifelong friendships. Some of my best friends are people I’ve met on my own message boards, so for me the site is an invaluable resource. And of course, you can get recipes there, too! DP: Your work over the years has played an instrumental role in doing away with many of the stigmas attached to veganism in general and vegan cuisine in particular. Can you speak to why we have seen a proliferation of vegan cafés, bakeries, five-star restaurants, and food products in recent years? IM: If I stare really hard in any given direction, a vegan chili dog stand will pop-up there. No, I think that vegan cuisine is getting taken seriously because it’s taking itself seriously. It used to be that you could throw a prepackaged veggie burger on a stale whole wheat bun and call it a vegan option. Not so anymore. I think that, first of all, vegans realized how important deeply satisfying food is. Honestly, if you aren’t satisfied, if you aren’t getting pleasure from your food, you might not stay vegan, no matter how strong your convictions. I’ve seen it happen all my life. In fact, it’s happened to me! And then there’s the obvious, there are so many more vegans that naturally restaurants and products are popping up to serve them. DP: You recently relocated to Omaha, Nebraska from Portland, Oregon, and you were born and raised in Brooklyn. Has living in different areas of the United States impacted your cooking and your approach to vegan cuisine? Is there such a thing as regional vegan cuisine? IM: There is regional vegan cuisine, for sure. I think it’s very similar to what regional non-vegan cusine would be (as in, if you’re in Mississippi you’ll get a vegan po boy), but there is still some nuance there. For instance, the Portland Tempeh Reuben. Why Reubens? Why Portland? Why tempeh? There’s actually a blog dedicated to that very subject. Minneapolis is known for its killer vegan Vietnamese food. NY for its Caribbean food. The Pacific Northwest in general slobbers up plates and plates of vegan biscuits and gravy. Living in Portland definitely impacted my cooking. It helped me to really connect to the seasons, to get out and pick my own berries, grow my own herbs. Nebraska is different because nothing really grows here during the winter, and I’m pretty much relying on Whole Foods for organic produce. But it’s helped me to get creative with what I have on hand, and I think that’s helped me to write better recipes that are more accessible to people that don’t live in a big city. DP: Your newest cookbook Appetite for Reduction just came out in January. How long did it take you to write and develop the recipes in the book? With this being your sixth book, does the writing process get any easier? IM: Yeah, it’s funny how much the writing process changes for a cookbook author. I feel like, from a technical point of view, my directions got simpler and more clear. It took about a year and half to write. There were some recipes that didn’t make it past the testing phase. If people don’t love a recipe, it doesn’t go in the books, it’s as simple as that. I used to struggle with that in earlier days, but now I don’t. DP: One commonality across all of your books is that your recipes call for nutritious whole foods, fresh ingredients, and are budget conscious. What’s different about the recipes in Appetite for Reduction? IM: I think I addressed some of those things, but all in all the book is more accessible. The recipes are faster or require less prep. It was designed with the weeknight chef in mind, not with the weekend adventurer. DP: I own many of your other cookbooks including Vegan with a Vengeance, Veganomicon, and Vegan Cupcakes Take Over the World. Every recipe I’ve made is absolutely delicious (and I’ve made most of them). Do you have a favorite recipe or two from Appetite for Reduction? IM: I’m thinking my favorites must be ones that I make more than anything so those would be the edamame pesto, the everyday chickpea quinoa salad, and the pot pie stew. DP: In recent years, there has been an upsurge in “junk food vegan” cookbooks focused exclusively on vegan cookies, cakes, and other treats. Is Appetite for Reduction in some way a response to those books? IM: No, not at all. Appetite was really written for me, as I stated in the introduction to it. But I figured if I was craving really nutritious, delicious, and easy weeknight meals, others must be, too! DP: Most health conscious cookbooks offer low-fat or low-calorie versions of high-fat, high-calorie dishes. Did you take a similar approach in Appetite for Reduction? Will your readers find healthier versions of vegan (and non-vegan) favorites, or did you develop most of the recipes from scratch? IM: Well, the recipes are from scratch but there are many spins on classic favorites. There’s a lasagna made with cauliflower ricotta, a clam chowder made with shiitake mushrooms and nori, gravies, and even onion rings. DP: Coming up with recipes from scratch or revisions of old favorites: do you find one more difficult than the other? IM: With savory food, I don’t feel like I ever can’t interpret a classic dish. It happens more often with desserts. So I still haven’t found a satisfactory rugalech or lemon meringure, but I will keep trying. DP: Appetite for Reduction doesn’t include a chapter on desserts. You’ve given us plenty of healthy vegan options for those of us with a sweet tooth in your other books. Why did you decide to leave out a dessert section in Appetite for Reduction? IM: Because if I want dessert, I’ll have dessert! When it comes down to it, fruit is really the only healthy dessert. I wasn’t interested in creating brownies with prune puree or muffins with apple sauce. And sugar, no matter how you cut it, is not healthy. So the book wasn’t really about that, it was about delicious, filling meals. DP: An increasingly large number of nutrition savvy and fitness conscious meat-eaters out there are now exploring a vegan diet for its health benefits. Did you write this book with those people in mind? IM: Yes, I did! I hope that they’ll find inspiration in the book and I hope that it will help them to keep up a vegan diet. DP: Other than fans of your past cookbooks and fellow vegans, who would you most want to pick up this book and start cooking? IM: I think anyone living on the Standard American Diet would do well to try these recipes out!